Saudi Arabia’s oil production varies according the state of the market and guidelines set by the Organization of Petroleum Exporting Countries (OPEC). Created in 1960, OPEC unifies petroleum policies among its member countries and ensures stability in international oil markets by eliminating fluctuations in prices. As a founding member of OPEC and its largest producer, Saudi Arabia has a leading role in guiding the organization to promote cooperation in energy issues, often acting as OPEC’s principal moderating force. Over the years, the Kingdom has helped prevent market crises that threatened to harm both oil producers and consumers. For example, during the Gulf Crisis of 1990-91 global markets lost four million barrels per day of crude oil supplies from Iraq and Kuwait. Saudi Arabia immediately responded by increasing production and averted what could have been a disastrous shortfall in global supply. 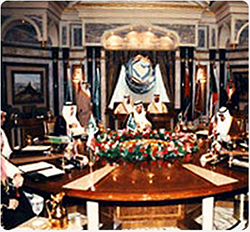 The Kingdom made similar adjustments to its production during other times of turmoil that threatened the global oil supply, such as the market fluctuations of the late 1990s, the 2003 Iraq war, labor unrest in Venezuela, supply disruptions in Nigeria and conflicts between Russian oil giant Yukos and the Russian government.